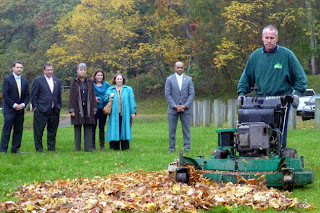 Instead of collecting leaves from the 44 city parks and hauling them to compost yards, city DPW/Parks crews will now be mulching fallen foliage in place and leaving the remnants behind as part of the “Love 'Em and Leave 'Em” initiative. 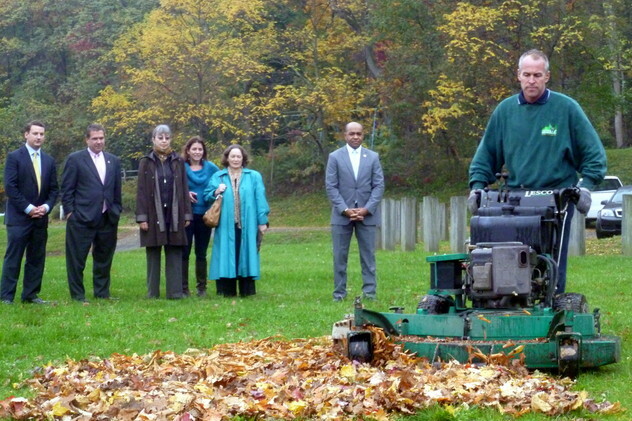 The program will help reduce the city’s annual $650,000 in 'tipping fees' while helping to reduce greenhouse gas emissions and turning leaves and grass clippings into nutrient-rich, natural fertilizing material for the Parks. Officials estimate that city crews and landscapers deposit 35,000 tons of leaves and grass clippings at the city’s Organic Yard every year. Shredding leaves on site in the Fall (and leaving grass clippings where cut) can save the city money on both the per-ton County yard waste 'tipping fees' and on the associated cost of packing leaves into trucks to be shipped out of the county for disposal/composting. Mayor Mike Spano announces the adoption of leaf-mulching practices in 44 city parks. 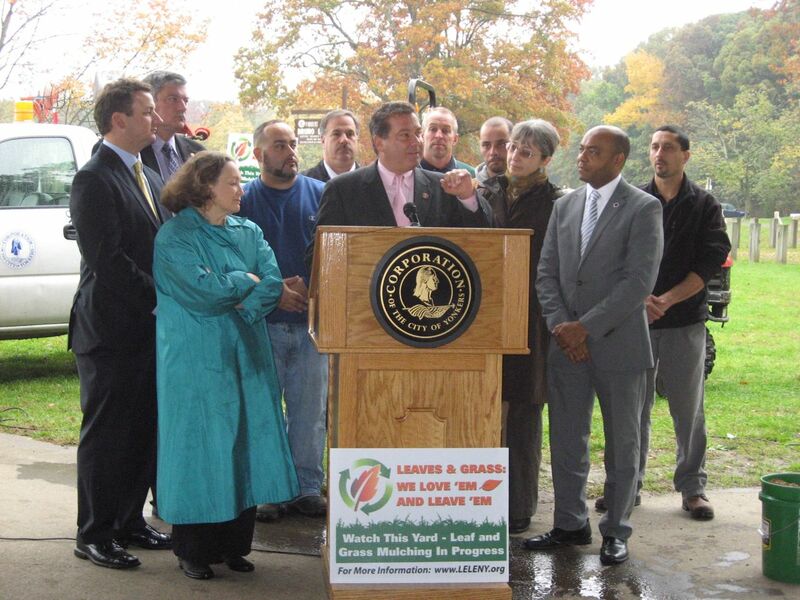 "With tight budgets and high labor and materials costs, adopting leaf mulching-in-place and grass-cycling practices in Yonkers makes a lot of sense,” said Mayor Mike Spano. “This is a perfect example of how being green does not cost money,” Department of Public Works Commissioner Thomas Meier said. “Here we have something that has a measurable impact on the environment and quality of life but is also something that saves money,” said Brad Tito, the city’s Director of Sustainability. With a little practice, many homeowners will find that mulching leaves in place is easier than raking, bagging, or blowing them to the curb, said Tim Downey, owner of Aesthetic Landscape Care Inc., who is training city crews in the art of leaf mulching. “Once you get the knack of it, you’re going to say to yourself, ‘Why wasn’t I doing it this way before?’"
City officials encouraged residents to follow their lead and mulch their own leaves. For residents who choose to bag their leaves, the Department of Public Works will continue to pick up leaves every Wednesday in the Fall. On these days, city trucks will pick up recycling and return for leaves placed in paper bags or open containers. Download the Press Release (.pdf). Read the full Yonkers Daily Voice article here. 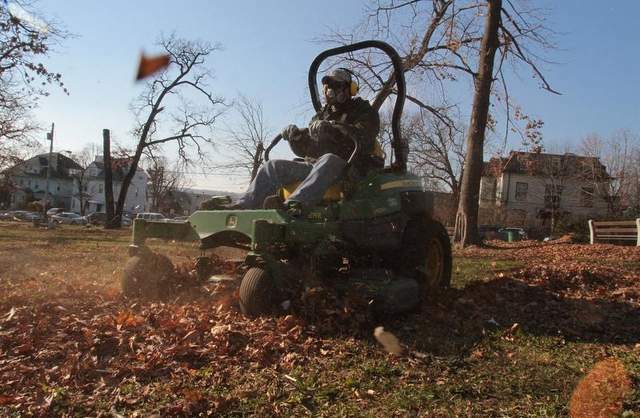 Read the front page article from the Oct 4, 2013 Journal News (LOHUD.com) - "Mow leaves instead of raking this fall, communities urge". Click image to view video in new window. 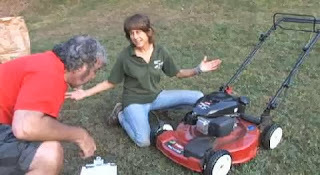 Read the related "how to" article from Oct 4, 2013 Journal News (LOHUD.com) - "Do it yourself: Homeowners can mulch leaves". 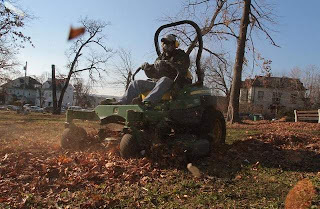 View the Fall 2015 schedule of mulch mowing training events. Yonkers City Council passes Resolution in support of LELE (January 14, 2014). Read full text of resolution (.pdf).